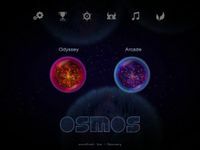 Osmos is a puzzle video game developed by Hemisphere Games for different systems as Microsoft Windows, Mac OS X, Linux, iPad, iPhone and iPod Touch. It is available on-line for $10 USD or £6.99 GBP. The game was made available on Steam on August 17, 2009. The aim of the game is to propel yourself, a single-celled organism (Mote), into other smaller motes to absorb them. Colliding with a mote larger than yourself will result in being absorbed yourself, resulting in a game over. Changing course is done by expelling mass. Due to conservation of momentum, this results in the player's mote moving away from the expelled mass, but also in his/her own mote shrinking. Source: Wikipedia, "Osmos", available under the CC-BY-SA License.